In July, 73-year-old Jim Gleason experienced the most emotional moment of his life at the bottom of the Pacific Ocean. He reconnected with his father, Seaman 2nd Class James Gleason, at his father’s final resting place within the wreckage of the USS Mississinewa. James Gleason was 33-years-old in 1944 when he enlisted in the U.S. Navy to help fight for his country in World War II. The 1933 Upper Iowa University alumnus and former captain of the Peacocks basketball team volunteered to serve, leaving behind his wife and young son, Jim, who was 4. Jim said he’s never been sure as to why his father enlisted. James Gleason farmed with his oldest brother near Webster City at the time and worked for the State of Iowa. For extra income, he officiated sporting events, but what he truly wanted to do was become a teacher and a coach. The Mississinewa was an auxiliary oiler that had just been commissioned in May 1944. Six months later, on November 20, anchored in the Ulithi Atoll with 800 other US Naval ships awaiting orders to invade Iwo Jima and Okinawa, the Mississinewa was struck by a Japanese Kaiten torpedo, or often called a kamikaze submarine. With nearly four million gallons of aviation gas, diesel fuel and fuel oil on board, the ship was engulfed in flames and began sinking within minutes. Sixty-three seamen died, including James Gleason, who had just come off watch moments before the 5:47 a.m. impact. Jim’s mother remarried three years later to a man who raised Jim. During Jim’s senior year of high school in Boone, Iowa, was chosen to attend the U.S. Military Academy at West Point. He graduated in 1962 and spent 30 months serving in the Vietnam War. After serving as a company commander in the 82nd Airborne and performing intelligence work in Okinawa, Jim was chosen as General William Westmoreland’s “eyes only” security officer and served him for six months before taking a post as the aide-de-camp for Westmoreland’s Chief of Staff. After the Army, Jim became an investment advisor in Los Angeles and later in Beverly Hills, where one of his customers was five-star General (Ret.) and former Chief of Staff of the U.S. Army and first Chairman of the Joint Chiefs of Staff Omar Bradley. In early 2005, Jim was sitting at his computer in Ranchos Palos Verdes, Calif., when the thought struck him to Google his father’s name. The first item that popped up on the screen was the dedication of Upper Iowa University’s Reflective Tribute Memorial commissioned by alumnus Stan Lee. His father was one of the men honored in the memorial for his ultimate sacrifice. 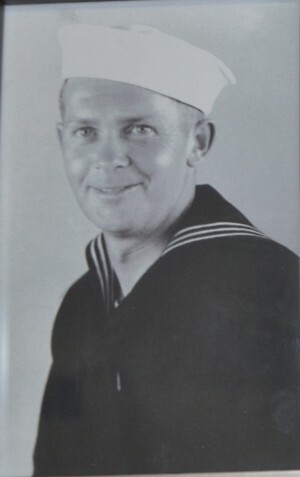 The next morning, Jim contacted Upper Iowa and thus began several correspondences with the University leading to the re-commissioning of a granite pillar for the memorial with a picture of James Gleason in his sailor uniform and a posthumous UIU Alumni Award honoring his father to Jim and his family. Jim also provided photographs and memorabilia for the World War II display in Garbee Hall on the Fayette campus, which includes a vial of oil that was taken from the Mississinewa. Growing up, Jim had always known the story of how his father’s ship had gone down. He knew about the 2001 dive team that finally located the wreckage of the Mississinewa when so many teams had failed. 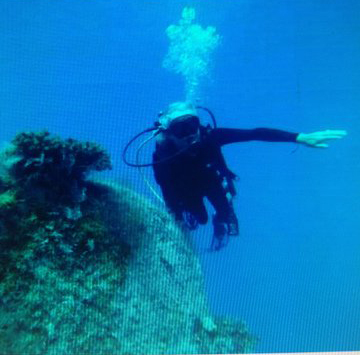 (The ship is upside down on the ocean floor and not easy to see.) The discovery later became the subject of a History Channel documentary. It wasn’t until two years ago, when his cousin called to tell him about a presentation she’d seen about the Ulithi Atoll, that his interest was reignited. He contacted the dive team responsible for finding the ship, Chip and Pam Lambert, who live in northern California. He met them and spent over two hours during lunch one day discussing the Mississinewa. Chip Lambert encouraged Jim to take up SCUBA diving, but Jim declined at the time. Chip offered to take Jim to the atoll to dive to see the Mississinewa in her final resting place. At first he declined, but a few months later, Jim called Chip and agreed to make the dive. Jim took the necessary training, and in July 2013, he along with his wife, son-in-law, son-in-law’s father, and a man whose father survived the Mississinewa sinking, flew to Yap, boarded a dive boat and embarked on a journey to the bottom of the ocean. “They put down a line, and the next thing I know I’m going down the line hand-over-hand and all of a sudden, I’m there,” said Jim. Part of the dive’s impact on Jim was the realization that throughout his life there never had been a grave for his father that he could visit. Jim said he is glad that he was able – at his age – to accomplish the dive and visit the place where his father came to rest 69 years ago. For more information on the USS Mississinewa, check out http://bentprop.org/mis/mis01.htm or http://www.ussmississinewa.com/FoundPR.html.